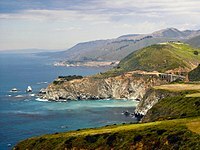 English: Big Sur - along and above the California Coast and Highway 1 in the Santa Lucia Mountains of the central California Coast Ranges. Located in Monterey and San Luis Obispo Counties, in central California. Protected within the Los Padres National Forest and several California State Parks. Media in category "Big Sur"